"We all serve in various ways. The question is whom do we serve. Being clear on that is important," said Jack Dangermond, Esri president, at the opening session of the 23rd Annual Esri International User Conference in San Diego, California. "At Esri, we're clear. 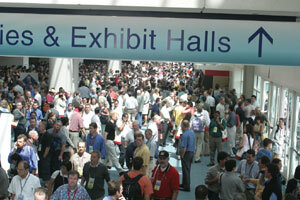 Our focus is on you," he told the plenary audience of more than 12,000 GIS professionals. Peter Hillary, son of Sir Edmund Hillary, gave the 2003 User Conference keynote address (see "Peter Hillary Speaks of Extraordinary Challenges"). Hillary said that the audience of GIS professionals deals with extraordinary challenges all of the time. "We need to see challenges in the context of the big picturejust another step in the time of exploration, looking forward, and doing great things while taking advantage of what we've learned in the past. Summits are lost ground. They are brief successes, and you must see them for what they are. The process of getting there is the exciting, dynamic part and it is ongoing. There is no end to the challenge." The plenary session included summaries of some recent developments with Esri's software and services. Esri's portal, the Geography Network, is providing thousands of services and will complement the Geospatial One-Stop effort. (See also "Riders on the Storm".) ArcWeb Services, a one-year-old Esri initiative, is a commercial set of GIS Web services that enables users to easily acquire data and image services without having to set up the services themselves. Several Esri team members gave software presentations that highlighted new software features, extensions, and expanded functions for ArcGIS 9, the next major release. ArcGIS 9 includes new capabilities in the areas of geoprocessing, annotation and labeling, raster data management, 3D visualization, and developer options. www.esri.com/arcgis. Dangermond told the plenary audience that Esri has experienced moderate growth this year and remains stable. There are more than 140,000 user organizations and more than one million seats of software in use. Dangermond commented, "Our purpose for 34 years has been the advancement of GIS. We generate the tools to enable the creation of geographic knowledge and its dissemination and use." Esri is also committed to providing forums for users to give feedback to the company such as the User Conference; building a global workforce of GIS users; and maintaining strong relationships with associations, universities, and its business partners. In addition to software and technical support, Esri supports educational activities, professional services for GIS, partnerships, and GIS in society. In 2002, approximately 60,000 students took Esri instructor-led courses. New courses are offered this year, and Esri's Virtual Campus has been expanded. More than 200,000 students participate in the site's courses, which together total more than 100 hours. Free, live online training seminars, introduced last year, have proven to be a popular resource as well. Solid Terrain Modeling (www.stm-usa.com) showed off their 16-foot by 24-foot model of Camp Pendleton, California, which was designed for training purposes. The award winning Esri Press offers more than 50 books about GIS science, applications, and technology. Twenty more are in development. Responding to user feedback, Esri has worked steadily throughout the year to improve technical support. Improvements include a call tracking system, better regional and international office collaboration, an online support center, and a bug search list. Esri's alliances, especially with HewlettPackard, IBM, Microsoft, and Sun Microsystems, have provided a strong technology base for its software. Last year Esri entered into an association with SAS Institute to bridge the world of statistics with ArcGIS. Additionally, Esri is working with Bentley Systems to similarly connect CAD professionals with GIS. Forming institutional partnerships is another part of Esri's work to promote GIS. 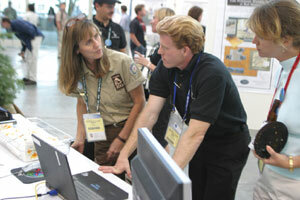 The National Geographic Society, The Associated Press, various United Nations organizations, the Global Spatial Data Infrastructure, the University Consortium on GIS, and the Association of American Geographers are among the many organizations that have been part of cooperative programs with Esri. 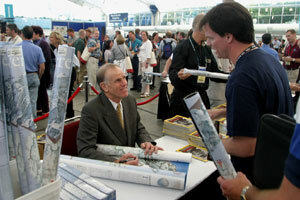 Esri's GIS in Society program sponsors several projects including the annual GIS Day. This year, the fifth annual GIS Day will be held November 19, 2003 (see "GIS DayNovember 19, 2003"). The Esri Conservation Program, along with Esri's partners, is assisting conservation efforts at more than 4,000 environmental organizations around the world. In education, Esri actively supports teachers with classroom material for learning GIS. Dangermond asked all at the User Conference plenary to get involved with a teacher. "Teach them about GIS and teach them about the wonderful world that's possible." For the third year, the Esri Educational User Conference was held immediately prior to the International User Conference. More than 500 conference attendees heard presentations on teacher education, instructional research, administrative use, using GIS in libraries and museums, and teaching GIS in K12 and higher education. In addition to a week filled with paper presentations, technical workshops, and exhibits, there were many awards and recognitions during the Esri International User Conference. At the plenary session, the U.S. Department of the Interior received the President's award for its pioneering spirit in its GIS work. Lynn Scarlett, assistant secretary for Policy, Management and Budget at the U.S. Department of the Interior, accepted the award. She said, "Geography and geographic information systems are our heartbeat. They lay at the center of much that we do. How well we use this data and use those information systems affects the lives of each and every American." Dr. David Maidment of the University of Texas, Austin received the Lifetime Achievement in GIS award for his distinguished work in water resources with GIS. Maidment discussed his work that led an effort to develop a customized GIS data model for water resources. The result is called Arc Hydro. Representatives from Hopeworks 'N Camden, a collaborative, nontraditional youth program in Camden, New Jersey, gave a presentation to the plenary session about their GIS program. During the summer of 2002, students produced a GIS of all 33,000 parcels of land in the city of Camden. More than 130 domestic and international organizations received Esri's Special Achievement in GIS award. They were honored for the benefits they provided through GIS to the people they serve. Herman Robinson, a retiree from the U.S. Fish and Wildlife Service, received Esri's Distinguished Service in GIS award. There were more than 15 special exhibits for conference attendees to view throughout the map gallery and other areas of the convention center. 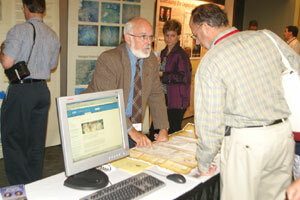 Attendees had an opportunity to see a display of David Rumsey's world-renowned collection of historical maps, which includes ancient maps, atlases, and books. A special Lewis and Clark Bicentennial exhibit highlighted geospatial data associated with the famous trail. The National Geographic Society hosted a major exhibit, and the National Center for Atmospheric Research showcased its work studying climate and weather. 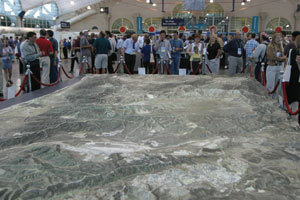 The National Aeronautics and Space Administration and the U.S. Geological Survey displayed throughout the conference area high-resolution imagery from the Landsat series. The Smithsonian Institution presented its recent work with GIS and the National Zoo. The Space Shuttle Columbia Debris Recovery GIS team display acknowledged the role of GIS in federal, state, and local government recovery efforts. The Federal Emergency Management Agency and the recovery team received Esri's Making a Difference award. 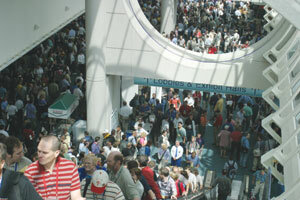 Please plan on attending the 24th Annual Esri International User Conference, August 913, 2004, in San Diego, California.